After we have repaired the foundation of the car, we need to make it look as good on the outside as it is feeling under the bonnet! Using sophisticated colour-match technology and water-based paints by De Beers we ensure that you cannot tell the difference between the original and repaired paint job. 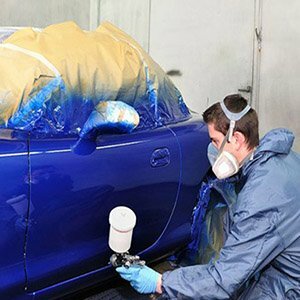 We also use a heated spray and dust extraction system to keep paint drying at the optimum level and preventing dust from damaging the paintwork. Our paint technicians receive continuous training in the latest technology and techniques, and we use only the top quality materials for a premium quality, manufacturer approved finish. See our Paintless Dent Removal services.